The US Army is looking to develop a family of three lightweight, highly mobile ground vehicles for a light infantry brigade as it conducts a joint forcible entry mission. If the service proceeds, it would field an air-droppable light tank called the mobile protected firepower (MPF), and ultra-lightweight combat vehicle (ULCV) and a light reconnaissance vehicle (LRV). The two latter vehicles would be sling-loadable by rotary wing to replace the Humvee. A competition for a Humvee replacement could reassemble the competitors for the US Special Operations Command (SOCOM) light vehicle awarded to General Dynamics, and which also featured bids by industry heavyweights Oshkosh and Navistar, analysts said. The vehicles align with Army efforts in recent years to become more expeditionary. "Some of this is, 'We desperately need to move back into the air-landing force role,' " as the Army recasts itself, said Atlantic Council analyst James Hasik. During the Army's yearly maneuver conference at Fort Benning, Georgia, ground vehicle requirements officials on Sept. 10 vetted plans for the three vehicles. 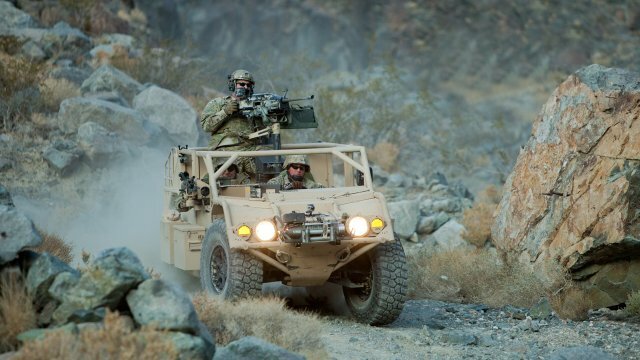 At one point Col. Rocky Kmiecik, director of the Mounted Requirements Division at the Army's Maneuver Center of Excellence, questioned whether the Army might pursue its own vehicle or SOCOM's Ground Mobility Vehicle (GMV) 1.1. After SOCOM awarded a $562 million contract in August 2013 to General Dynamics for 1,297 GMVs, AM General filed a federal lawsuit against the command, since dismissed. AM General and fellow losing bidder Navistar had submitted formal protests with the Government Accountability Office, which denied the protests. Oshkosh Defense, which had also been eliminated from the competition, filed a protest and later withdrew it. "Because of the volumes involved, more than SOCOM, [an ultra-lightweight combat vehicle competition] should attract more companies, companies who say they have an advantage in high-volume, low-cost production," Hasik said. "The number of companies bidding on this could not be fewer than bid on GMV." The three vehicles are envisioned for an airborne infantry brigade combat team (IBCT) as it conducts a joint forcible entry mission, rushing forces from their airborne insertion point to the seizure of their objective. The objective would become a forward airfield for reinforcing and follow-on forces, a Stryker brigade combat team. Conceptually, the IBCT's ULCV and LRV would be backed up by a company unit with the MPF. At the highest priority of the three, the ULCV would provide a nine-soldier infantry squad with tactical mobility, carried by sling load from a UH-60 Black Hawk or inside a CH-47 Chinook in high and hot conditions, and be air-droppable from a C-130 or C-17 aircraft. Its initial operating capability is slated for fiscal 2016. A demonstration of the technology in June at Fort Bragg, North Carolina, validated the requirements, according to an Army information paper. Six vendors took part, comparing their vehicles to the Humvee as part of a global response force mission. At a maximum of 4,500 pounds, and with a range of 250 to 300 miles on a full tank, the vehicle is meant to be light and fast, to deliver soldiers from a drop zone far from enemy air defense artillery or indirect fire systems. Five would carry a platoon headquarters, three rifle squads and a weapons squad. As its name suggests, the vehicle would be light and fast, eschewing armor, advanced surveillance or communications gear or weaponry except for a squad's crew-served weapon. The vehicle is a departure from the joint light tactical vehicle, an armored Humvee replacement, which would carry five soldiers and can use only a CH-47 for vertical transport. "Think of this as a 21st century jeep," Hasik said. "To make it lighter, you can either make the whole thing out of titanium or remove the protection requirements, and it seems that they have gone with the latter." The theory is that troops in a forcible entry mission would outpace an enemy's ability to deploy roadside bombs, and heavier armored vehicles would be deployed later. According to Kmiecik, the light vehicles would not be used by the time troops had set up forward operating bases. "You're not using this to do the supply from Taji to Baghdad, down the highway." Frost & Sullivan analyst Wayne Plucker credited the conceptual vehicles as more sustainable than the multi-ton mine-resistant ambush-protected vehicle, and said they might allow troops to operate a week without support, from an "airborne beachhead." "My Marine colleague here called this, 'too light to fight,' " Plucker said. "The Marines have several layers they can bring in via sealift, and this is the Army saying, 'we can do this too,' but they might need to finagle on the weights and sustainability. ... If we were inserting ourselves into Africa, say, not near a coast, it would probably work for a while." The LRV, envisioned for a six-scout squad, would host basic and advanced surveillance systems. Infrared systems, ground surveillance radar and links to UAVs would be among them. This would replace Humvees kitted with surveillance gear. Not meant as a fighting vehicle, it would have a medium-caliber weapon system and baseline protection against small arms, 152mm shrapnel and anti-personnel mines, with the ability to receive heavier armor. The LRV's capabilities development document is still in draft form; its estimated operating time frame is fiscal 2020. The platform is considered to be in the technology development phase with plans to hold a performance demonstration in the third or fourth quarter of fiscal 2015. To be considered, the vehicles would have to be transportable inside or by sling load by a CH-47. The MPF, envisioned for 2024, has an initial capabilities document scheduled for consideration in October by the Army Requirements Oversight Council. In concept, the MPF would quickly engage enemy forces, protecting the infantry brigade's freedom to maneuver. The MPF would target bunkers, armored vehicles and objectives behind walls with modern infrared and fire control systems. Its base armor would protect it from 152mm shrapnel — which would also cover Russian-made artillery rounds — and a one-hour conversion to full combat mode would include underbelly blast protection. The light tank would be maneuverable in urban, forest, jungle or mountainous terrain and be able to keep up with an infantry brigade's organic vehicles. It would also carry enough fuel and ammunition to operate for 24 hours after arrival without a resupply. "As long as the tank isn't moving for the 24 hours," Plucker said, "and does stationing and leap-frogging between them, which is a common technique, maybe. It's stretching what we can do now by a decent measure."